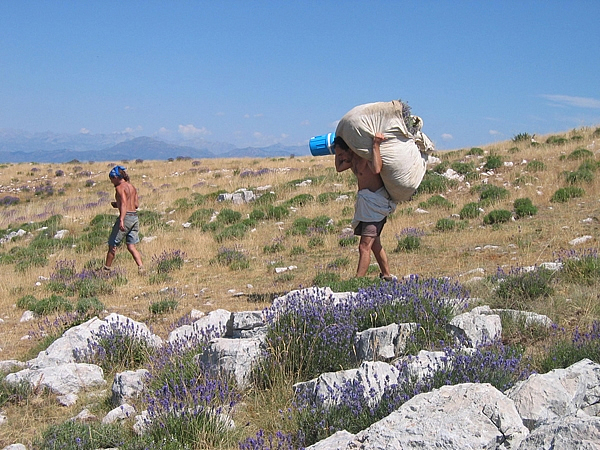 Roots of Aromatherapy: The picture above shows stands of wild Lavender in the Montagne de Lure and the panoramic views the men gathering the Lavender can enjoy. True wild Lavender has evolved as one of the most important essential oils for preventive aromatherapy. Wild Lavender consistently has a more complex composition than population Lavender. The oil is used for relaxation, anti-inflammative effects for the skin and to induce a peaceful state of mind. The essential oil mediates the virtues of the plant, to survive and maintain with dignity, even in rough and challenging environments. Currently, we are offering the softest, most elegant oil from our long-term source in Provence. Certifed organic by Ecocert and SIMPLES. The distinction of above or below 1200 meters is actually not necessary anymore because notable populations of wild Lavender have receeded to above that altitude. There is no more wild Lavender growing below that elevation. The small image on the prior page shows a stand of wild Lavender. These unpretentious plants are decades old. Not every year is prolific for wild Lavender.